Simone's main research areas are compilers and virtual machines, with special interest in computer architecture, runtime systems, operating systems, and programming languages. Simone started the HELIX research project at Harvard University in 2010 as a post-doc working with Profs. David Brooks and Gu-Yeon Wei. HELIX uses static and dynamic compilation, run-time optimization, and architecture specialization to extract coarse-grained parallelism for many-core architectures from complex "sequential" code. Simone received his Ph.D. degree with highest honors from Politecnico di Milano University in 2009. His dissertation discusses theoretical and practical performance implications of thread level parallelism. To this end, Simone designed and built a bytecode virtual machine optimized for commodity multicore platforms. 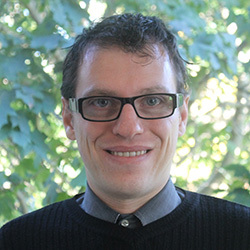 Simone is the author of ILDJIT, a parallel compilation framework that includes static and dynamic compilers as well as a bytecode virtual machine. 1. Enrico Armenio Deiana, Vincent St-Amour, Peter Dinda, Nikos Hardavellas, and Simone Campanoni. "Unconventional Parallelization of Nondeterministic Applications". 23rd International Conference on Architectural Support for Programming Languages and Operating Systems (ASPLOS) 2018. 2. Simone Campanoni, Glenn Holloway, Gu-Yeon Wei, and David Brooks. "HELIX-UP: Relaxing Program Semantics to Unleash Parallelization". 12th International Symposium on Code Generation and Optimization (CGO) 2015. 3. Simone Campanoni, Kevin Brownell, Svilen Kanev, Timothy M. Jones, Gu-Yeon Wei and David Brooks. "HELIX-RC: An Architecture-Compiler Co-Design for Automatic Parallelization of Irregular Programs". In proceedings of the 41st International Symposium on Computer Architecture (ISCA) 2014. 4. Vijay Janapa Reddi, Simone Campanoni, Meeta S. Gupta, Kim Hazelwood, Michael D. Smith, Gu-Yeon Wei, and David Brooks. "Eliminating Voltage Emergencies via Software-Guided Code Transformations". ACM Transactions on Architecture and Code Optimization (TACO) 2010.